Portia is excited to spend the summer with her cousin, Julian, but she never expects that they will discover an abandoned lakeside community, or that they will make friends with a pair of elderly siblings who still inhabit two of the rundown houses. At Gone-Away Lake, as their friends Aunt Minnehaha and Uncle Pindar call it, Portia and Julian discover life as it was 50 years ago, while having their own summer of modern-day adventures they will never forget. In this book, as in The Saturdays, Elizabeth Enright celebrates childhood independence. Whereas the Melendy kids explore New York City unsupervised, with just their allowance to pay their way, Portia and Julian are given free rein in the country, where they can enjoy the secret of a forgotten village, and make new friends without sharing them with their parents or with Portia's little brother, Foster. Especially interesting about this story are the connections Portia and Julian feel to Minnehaha and Pindar as children. They never tire of hearing about their friends' fights, friendships, and adventures, and they engage with those stories so fully that they are inspired to create a club of their own in the hopes of recapturing some of that fun and excitement. Some things about this book bothered me. I couldn't quite buy into the notion that an entire group of fairly wealthy families would abandon not just their homes, but all the contents of those homes, and never return for them. I thought this might be explained at some point, but it never was, and I was distracted by the feeling that there should have been some big reveal of the "truth" about Gone-Away. I also couldn't help but feel that Minnehaha and Pindar were living like Miss Havisham - waiting for the return of a day that would never be again. Perhaps this was intentional, as I think Portia and Julian breathe some fresh air into the lives of the two older people. Still, I wanted the characters in the story to feel disturbed as I did, and instead they were almost too accepting of the whole strange scenario. That said, this is a well-written book full of interesting situations, well-described characters and settings, and everything a child wants in a summer story. I am not surprised that it was a Newbery Honor book in 1958, and I think, of the Newberys I've read, it's one of the older ones that still holds up well enough for contemporary audiences. It is similar in some ways to Miracles on Maple Hill - both books are even illustrated by the same artists, Joe and Beth Krush - and I think it also compares well to the Swallows and Amazons books, A Lemon and a Star, and The Railway Children. 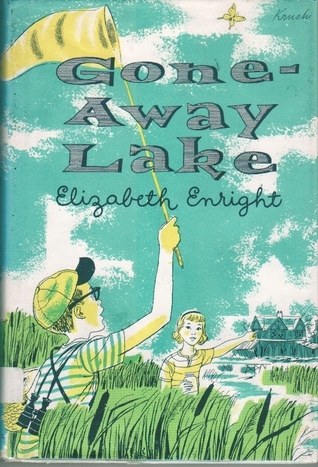 There is also a sequel, Return to Gone-Away, published in 1961. Haha, the messes I can believe! And I guess if you think about it from the perspective that these people would have the money to replace whatever they lose, it might make more sense for expensive things to get left behind. Thanks for the insight!